I know a lot of you don’t like Amazon’s affiliate program. After all, the commissions are incredibly low and why use them when there’s AdSense, Clickbank, etc? Well I love it. It’s a catch-all affiliate program when you need an affiliate link for products that aren’t tied to an affiliate program. 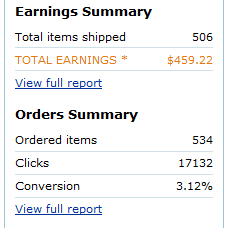 I don’t earn a lot from Amazon, but I did have a record 3rd quarter in 2013 and made $459. Most of the earnings were from products I didn’t even promote. They were from Amazon’s effective “recommendation strategy” that gets people to purchase more than they planned to. 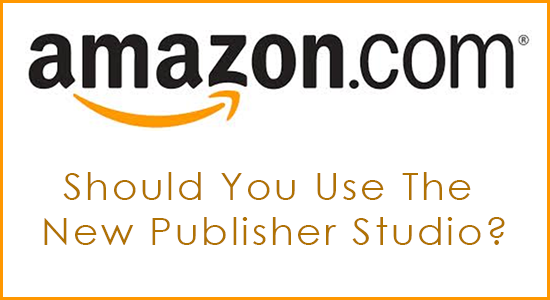 At the end of last year, Amazon launched a new tool called Publisher Studio. It allows you to create links on your site without even editing your page. Seems pretty cool, right? At least I thought so. The only thing I don’t like is that I have to add additional code to my site, which could impact loading times. What if their plugin technology is down? How will that affect my links or how my site functions/loads? The good news is you can add the code to the footer so it shouldn’t really have much of an impact on load times as long as everything is working on their end. Call me paranoid, but I don’t like that the overlay technology is hosted elsewhere. Granted that’s how some other tools work online, but this product is still in Beta, so I’m going to wait on this. I’ll just keep using manual links or Chris Guthrie’s Easy Azon plugin (affiliate link). Chris sent me a free copy in exchange for an affiliate review a few years ago. Thanks Chris! Watch my video demo here. As soon as I heard about Publisher Studio, I wondered how this new functionality would compete with his product, but I don’t think Chris has much to worry about. His plugin gives you more control over how you create the links anyway. I hardly ever use banners. I just use good ole’ fashioned contextual text links — meaning I just add them to my content when relevant. And as you can imagine, I convert best when I promote products I use. For example, people are ALWAYS asking me what camera I use for my YouTube videos. So on my Tools page here, I have a simple link to Amazon.com. Sounds pretty boring, eh? But it works! You just need the two T’s. Traffic and Trust! Just recently I started using another strategy I got from Spencer Haws’ blog. He recommended the WebSimon Plugin on a post about creating a product comparison chart. This is a great plugin to use for Amazon affiliate links and it’s free! 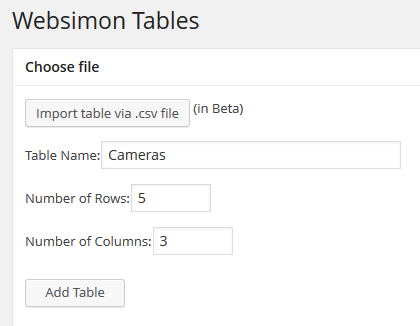 You can easily create a comparison chart/table and the plugin even re-sizes the images automatically. As you can see from the screenshot above, you can even import the data from a .CSV file. You can even move columns/rows left and right or up and down by using the arrows on the side and top. You can also adjust the styling of the table pretty easily. 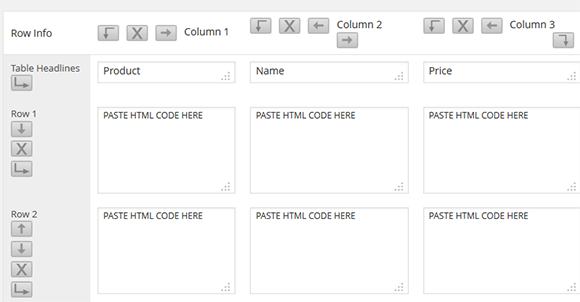 After you’ve entered the data for your chart, just grab the WordPress shortcode that is created and paste it into your site. The only thing I don’t like is that it’s not mobile responsive, so some columns may be cut off when viewing on smartphones. In today’s times you have to consider the mobile view with so many people using smartphones to browse the Web. To remedy that, try to keep your columns to a minimum (no more than 3 or 4.) Or if you must have a lot of columns, put the most important info in the first 3. Here’s a quick chart I setup using WebSimon that shows cameras from Amazon.com. What’s great about this plugin is you can use it for any comparison chart, not just Amazon links. If you’re a hosting affiliate, for example, you could setup a comparison chart of the various hosting platforms. Just one quick tip. Instead of listing the price, you might want to create some kind of rating to indicate cost — especially if you’re promoting Amazon products. Their prices change all the time so that would be a pain to monitor. 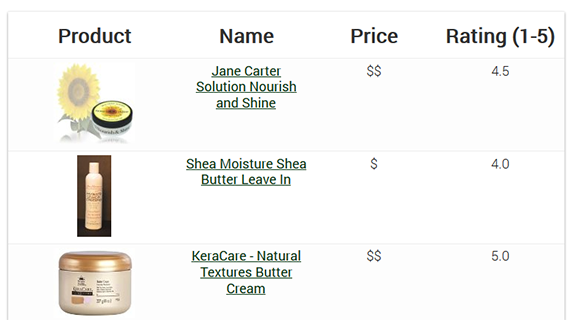 On my hair site I use dollar signs to indicate price range. So products under $10 get one dollar sign, etc. I used the star ratings on Amazon for the Ratings column. Granted these change too, but not as drastically and often as the price. So that’s my Amazon strategy in a nutshell. See, I told you it is simple! What Do You Think of The Publisher Studio? Are you impressed? Will you start using this or will you continue to add affiliate links the old way? I just got back into Amazon marketing, working on a Authority Site (MemoryFoamMattressTopper.cc) and was looking for a price comparison tool/plugin do the former premuim plugin that I was using in the past, no longer working. Best and may God Bless! I a had a problem with APS when I moved my website to Bluehost, All of links disappeared and when I tried again to link the products no thing happened and I still see no-links (shop now links), I tried a different browser and a different Tracking ID but everything still not working. Another problem with Amazon Publisher Studio is that it using the main Tracking ID with the one that you decided to use to track this website, That’s mean you can’t hide your footprint and if someone want to know all of your websites he just need to googling your main Tracking ID. I think this tool is very Beta and still need a lot of work to make it work more productivity. I have to correct this, the first problem not related to Bluehost but it was a confilection between APS and “Imaguard” plugin, I think the Imaguard recreate the images every time the page loaded so the APS considering this image as a new one and then doesn’t show the links. I deactivated this plugin and APS works, sorry it was my bad. This means that the links only appear when a reader is directly on the post itself; they do not appear on the blog’s main page when that post is shown. Therefore, people who only read things off of the main page will never see the affiliate links. While the tool is incredibly convenient, I think this flaw may make it a deal killer. Oh this is a great point for those who display snippets or full posts on the homepage. Never thought of that. Did you try it? One big flaw with the Publisher Studio tool is that the links are associated with the URL, not with the content. This means that the links only appear when a reader is directly on the post itself; they do not appear on the blog’s main page when that post is shown. Therefore, people who only read things off of the main page will never see the affiliate links. While the tool is incredibly convenient, I think this flaw may make it a deal killer. Lisa Irby…. I have seen almost every video tutorial of you on youtube. I didn’t come here to comment about this article but to give you thanks. I am totally a newbie in blogging world. I am learning from your tutorial. English is not my main language so if you find any mistake in this comment hope you will forgive me. Thank you very very much. I am unable to get any success from my Amazon affiliation 🙁 My Amazon affiliate account has been banned twice for inactivity and I am making no earnings from it. Please don’t trash the comment if you feel I shouldn’t place the link here. Simply remove the link and publish it. So, if you saw that article, I have placed amazon widget at the end. How do I improve my conversion rate? I never have much success with adding image widgets but if you are going to use them, align them to the right/left within the post. Also use more contextual links that flow within the content. That image ad may get ignored because it screams “ad! !” I convert best with links within the post. Also try setting up a product comparison chart with the Websimon plugin and all the product links can go to Amazon. Use the example I gave in this post. I’ve spoken to a lot of people who haven’t had much success with amazon affiliates. Click through rate optimizing is essential unless you have massive amounts of traffic. I wouldn’t recommend a blogger uses it as their only source of income but it could be a nice addition if it can be done tactfully. Although the commission percentage from Amazon Affiliation seem low but I think this depends on how much sales do you drive. Dealing with one niche can help. But I real appreciate your tips Lisa. What is your sense of putting affiliate links on non profit sites to resources? For example, if I have a non profit religious site with a recommended book readings list. Since folks are going to buy those books anyway, why not use affiliate links, so that the little bit of extra earnings can go back as donations to the organization? What do you think? I think as long as you disclose your affiliation then that’s fine. I have been using Amazon for almost a year. And I have promoted a couple of products in Amazon and got great response. But haven’t use Affiliated programs of it. I hope I will use it soon. Sounds similar to Skimlinks. Do you have any control over what gets linked? Lisa- yes, you have not only complete and total control over what keyword and static links are getting encoded, but also control over exactly where those links lead to on an online retailer’s website. Thanks. I’ll look into. Never heard of you guys and it seems you’ve been around for some time now. Do you have any working examples of sites that are earning? It would be great to see that. I don’t typically do well with these kinds of programs but I’m always open to exploring. I think as long as you disclose this then that is fine. Great, thanks for the advice, and taking the time to respond! I would like to try it. I just wish it helps to increase my sales. Thank you Lisa, you have given clear explanation about the a-z’s affiliate tool. Why commission from amazon is low? What about commission junction? CJ is fine if there are relevant products/merchants for your site. Any network is fine. It depends on what you are promoting. I was really confused about amazon, but i am really satisfied. Thanks 2CreatAWebsite.com! Because of the low commission rates there is low competition in Amazon as compare to ClickBank and other marketplace. When the competition is low, profit margin is always high there. And the way customers are recommended with similar products also increases the chances of affiliate commissions. So I personally think Amazon has more potential then any other marketplace. Thanks for the sharing the tool. It will defiantly provide value to the affiliate marketers. I have two question 1. Can we used amazon affiliate links on content websites such as squidoo, hubpages etc. I know many people are already doing this, but I am not very sure if this is allowed. 2. Can we use affiliate links on social medial websites such as facebook, twitter etc. Here, I am not talking about sharing posts with links but direct links. There is a lot of confusion online as far as this issue is concerned. 1. You’ll have to check with their rules. I don’t use either so you’ll have to see. I think I remember hearing if you have a certain account status/level you can add links to your site or affiliate links but I’m not sure. 2. Some have said you are not supposed to use direct affiliate links but again you have to read the terms. If I do, they are tied to posts I share. I never just drop an affiliate link on social media. I use amazon a little and I made some good extra money. I have some places where I think I could make some money using those ideas. I use a Table plug-in for my product comparisons but I may trial your version as well. For links I usually input them manually so I know exactly what I am doing. I’ve always used Reviewazon as well as Amazon widgets and I sell quite a bit on Amazon. I decided to give Amazon Publisher Studio a try before Christmas because I like what it does. My visitors can mouse over an image and see the Amazon price and rating. If it’s not working, I still have my images linked to where I want the user to go, so I’m not worried about their server going down. HOWEVER, my traffic has really started to drop and I’m wondering if something in the Google algorithm has noticed this addition to my site. It could be something else, but I’m about ready to remove the links and see if traffic comes back. Hi Val, I doubt it’s that but Google did have some kind of algorithm change on the 8th or 9th. Was that when you noticed the change? No, it happened back in early December I think. It’s still really low and I have removed some of the links, but not all. I think will take them out now as I have read that a few others with the same concerns. Thanks for sharing this. I actually don’t consider myself an affiliate marketer whatsoever. I have written a few books and learned that when selling my own books it made more sense to use the Amazon associate setup (which was easy both for amazon.com and amazon.co.uk) – apparently this increases the commission you get per sale slightly because you’re paid for the sale of the book as the author then a tiny bit more from the recommendation as an associate. So through doing this I actually have ended up doing some affiliate marketing, though I’ve never used anything else such as clickbank or spaghetti junction or whatever it’s called. I have thought about it though – should I be selling my products on these sites too – aren’t some of them seen as spammy/low quality? Later I learned that some authors have had pleasant surprises when someone buys a more expensive product within 24 hours of clicking the link (again above from you) and when I got my first royalty check I thought that had happened because it was more than I was expecting (even better, it was all from book sales so that was cool). So this hasn’t happened to me yet but it’s a really nice bonus and the possibility is always there for every single link, isn’t it? I’m guessing no other affiliate sites do this? So far I have just gone to the toolbar in Amazon itself and cut & pasted the appropriate link that way. Given that it’s no great hardship to do this each time and I’m not exactly promoting hundreds of products, like you, I’ll continue to do it this way, particularly as I also like to keep the code on my site to a bare minimum. It does look pretty slick though. Some affiliate programs actually have cookies that last 90 days. A lot of people actually criticize Amazon because the cookie is so short. So 24 hours is usually not the norm. Most affiliate programs have a 30 day cookie at least for anything sold on their site. I meant the bit where you get paid for people buying other stuff which is nothing to do with you but because they got there via your link – do other sites do that? p.s. I have a plugin to suggest for you – ReplyMe, are you familiar with it at all? This tool looks promising but unfortunately, I don’t have the option for this publisher studio in my Amazon dashboard. Are there any threshold or criteria to get the access?. I make only $97 from Amazon . What WordPress theme do you use for your Amazon sites? We enjoy your newsletters-they are informative and to the point. Keep up the good work. Hey Ron, I use StudioPress Genesis themes for all my sites. For the one I mentioned here I use the Magazine Pro Genesis theme. Maybe yes but can it make my money double? Add To Cart functionality (makes cookie length 90 days if user adds item to shopping cart instead of 24 hours) and several other things. Thanks for mentioning EasyAzon and if you log back into the members area you should have v3 available for download. Chris I’m glad you posted because I lost all my member credentials. For some reason I think you just emailed me the file. In any event I don’t even know what email I have registered. Can you help? Thanks! Just sent you an email – thanks! Glad to know you enjoyed the holiday. I bet you had a great time! I just logged into Amazon but I don’t have the option for the publishers studio. I make very little sales with Amazon, so I’m assuming I didn’t reach the threshold – or perhaps I’ll get access when it comes out of beta. Thanks for the walk-through Lisa, I always learn something new from your videos. Chat soon! Hey Ileane! Happy New Year. Someone else said the same thing and I guess it does depend on earnings. I had no idea. Thanks for letting me know. Have a great week! I guess if it helps to pay your cable bill then go for it. Even though your earnings is small but it still helps to add to what you’re already getting. As for the Amazon tool it seems to be a great thing. Even though I’m noe on that affiliate program, I know someone who would be interested in it. I will refer this post to him. If I am ever going to join that Amazon program then I think your post would be an awesome help for me. Thanks for sharing. I use amazon a little but have yet to make any money. Of course working in a niche where there are almost no products does not help, but now with your ideas I have some places where I think I could make some money.